New York Good Standing Certificate | Online Corporate Docs, Inc. The New York Certificate of Good Standing is an official document issued and bearing the printed seal of the New York Department of State that certifies that your legal entity is existent with the State of New York and provides the status of the corporate entity. 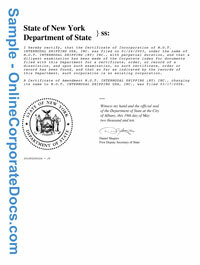 The Office of the New York Department of State will issue a Certificate of Existence to any domestic or foreign profit, nonprofit corporation or LLC/LLP that was duly registered or formed within the State of New York and will state whether or not the entity is in compliance with the Department of State. The New York Department of State registers corporations and will issue a certificate of good standing to any registered domestic or foreign corporation or LLC that is in good standing. The official certificate is a .pdf laser printable document that bears the great seal of the New York Department of State and includes the business name and date of incorporation and stated that the entity is existent.